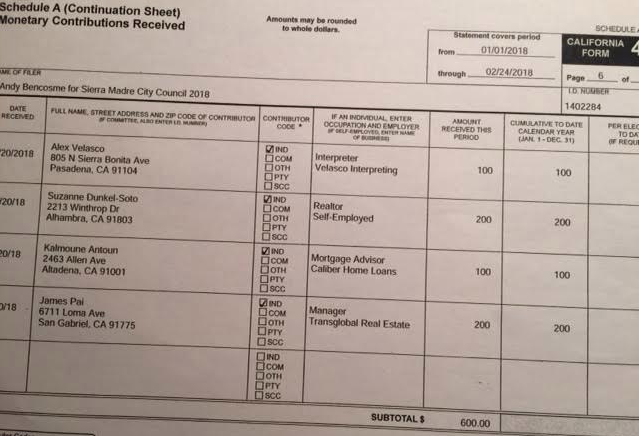 The following should help reinforce the notion that Andy Bencosme is not running a Sierra Madre centered political campaign for City Council, and that he really doesn't know very many people living here in town. Or anybody outside of his immediate associates from work since almost all of his campaign donors are either Realtors, or employed in businesses that have something to do with the selling of houses. Making this all a very narrowly focused and possibly only one issue based campaign. Below are the currently available three pages of Andy's City Council campaign 460 Forms. These roughly cover the months of January and February, and list all of those who donated money to him in the sum of $100 or more. Like all of the candidate's 460 Forms they are available at City Hall and can be obtained there if you show up and ask the always helpful Laura Aguilar to get them for you. The FPPC requires that the filings of candidate campaign finance disclosures be immediately available to the public upon request. All you need to do is ask nicely. Outside of Andy himself, the one person here who actually gave a Sierra Madre address is Kristine Mathison. Yet if you check that address you'll find it is the location of the Century 21 offices where Andy Bencosme works, and that she actually lives in Arcadia. Like all of the Bencosme campaign donors listed here besides Andy himself, Kristine will not be able to vote in this election. A cursory Internet search will help to confirm that Andy's donors are almost all in the real estate business. As an example, Andy Storch, who lists himself on the form as being a "certified life and business coach," can be found on Linked In (link) and is identified there as employed by Christie's International Dilbeck Estates in Pasadena. This all sheds a little more light on why Andy held his campaign kickoff event at the Arcadia Association of Realtors offices rather than somewhere here in Sierra Madre. His supporters were much more likely to actually know where that was. Mod: Switching gears, here is an interesting Pasadena Now article. In Sierra Madre, City Demands Political Group Stop Using City Logo to "Mislead Voters" (Pasadena Now link): The City of Sierra Madre has put TeaPac and the two proponents of Measure D on notice that they must immediately cease and desist the unauthorized use of the City’s logo in their Stop the UUT campaign literature, or face legal consequences, including a potential lawsuit. After receiving telephone calls and emails from confused or angry residents demanding to know why the City’s well-known and loved wistaria logo was being used in Measure D campaign materials, the City was forced to take immediate action to stop the deception. Use of the City’s logo without express written consent is a violation of the Sierra Madre Municipal Code and may be enjoined as a public nuisance or enforced as a misdemeanor. Use of a city logo or seal in campaign materials in a manner that misleads or gives a false impression that the campaign materials are authorized by a public official is also a violation of state law. Unlike private committees and initiative proponents, Sierra Madre is held to a higher standard by the Fair Political Practices Commission to communicate only truthful and accurate information to the community on the impacts of proposed initiatives, and cannot produce campaign literature. The use of the City logo to communicate false information in campaign literature is deceptive and misleading. The March 8th TeaPac email, which used the City’s logo, contained several false statements about the City’s fiscal condition. The Utility User Tax (UUT), which is a 10% local tax on utilities, produces $2.6 million in revenue annually, making up 24% of the General Fund, and pays for Police, Fire, Library and Community Services. The rest of the article is available at the link I provided above. Obviously Measure D is dead on arrival. By my estimate it will be lucky to garner more than 20% of the vote. Obviously nobody is going to be able to preserve much of anything in town if you murder City Hall by stripping it of a quarter of its funding. This really would be an act of community suicide. So while I can understand why the city can't kill this measure enough, I'm not sure I buy into the notion that the Measure D campaign is based on nothing but lies. Can anyone tell us what percentage of Sierra Madre's budget is consumed by its bond debt and outsized CalPERS obligations? I know we've covered that here before. An eternal 10% UUT didn't just happen all by itself, you know. And is certainly no guarantee that taxes won't have to be raised here again. Or so you'll be told. Andy may be a real nice guy but for Sierra Madre it would be devistating to give the Arcadia real estate establishment a seat on our city council. We need to re-elect the 3 incumbent candidates, Arizmendi, Delmar, and Goss. Like them or not they work well together and have an excellent voting record on Preserving Sierra Madre while promoting responsible growth. I agree, 6:34. I just hope enough residents get the information about Benscome that they need to see what he's really about. Then if they want a realtor/developer guy to make policy, so be it; but no one should buy the he got into the election out of "love for Sierra Madre." Andy is carrying the water for the realtors. Do you think they care more about preserving Sierra Madre or making a big real estate commission. You decide. Why are are those people from out of town interested in our city council? I get it that state and national politics involve everyone, but not local politics. Alhambra, Altadena, Pasadena, L.A., San Gabriel - what the heck? If the Arcadia Association of Realtors gave a party for Benscome, I'd expect to see a donation from them, but there isn't one on the papers. Let's see. All of Andy's campaign donors so far are out of town realtors. He owns two houses in Monrovia but rents in Sierra Madre. And he has campaign signs all over Arcadia. Sure. Just don't go calling him a carpetbagger. That wouldn't be nice. This is just weird. Do those people own property here? Maybe they don't own anything here, but you know they love Sierra Madre. Andy usually has this expression on his face like something smells bad. 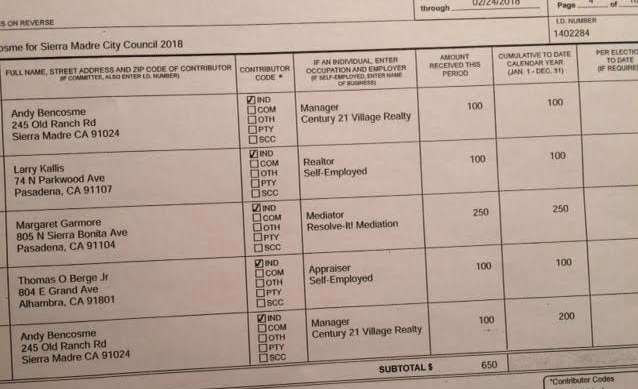 Makes you wonder how many other realtors, developers, and contractors gave Andy donations of $99.00 and under which do mot get reported. 6:45, the Arcadia Assoc. 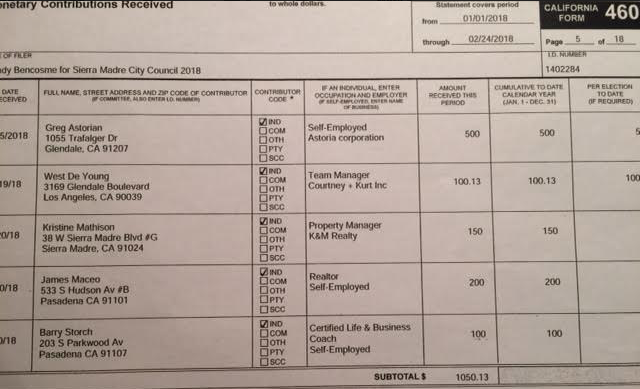 of Realtors' donation is "In kind" non monitary and not reported. Thanks for clarifying 7:15. I thought an 'in kind' over a certain amount had to be on paper, too. The AAR is probably being cagey about their donations. They got ridiculed and defeated the last time they spent big bucks to influence a Sierra Madre election, the one for Measure V.
We'll find out about AAR money, but probably not until after the election. It has now become a dirty secret they'll try very hard to keep under wraps. Arcadia Andy must think the people in Sierra Madre are beyond stupid. He does. Andy is running an issueless campaign designed to appeal to people who don't know anything and feel threatened by those who do. It is a strategy that has worked before. Just ask Nancy Walsh. Nancy Walsh is the Civility Party candidate who finished her term calling her successors "child molesters." Campaigns are expensive. Anyone running for a seat on the council in Sierra Madre knows this. There are people in Sierra Madre who will donate to a campaign. The other three candidates have managed to pull that off. This would have been a minimally expensive election cycle - except for this late entry hustler. "Andy" is costing us all. Jerry Brown is raising taxes again in California. Measure D has a good chance of being repealed. When the Council shows transparency in city spending, then Sierra Madreans may be willing to give more. Measure D will have to be passed before it can be repealed. Resident Ron Brandly, resigned his position as a member on the Planning Commission,after a few meetings with the City Attorney over conflict of interest as a Downtown business owner and a member of a local church, both located in the DSP area, at that time. A person's background does not determine how they will vote while sitting in a City Council seat. That is the "job" of the law firm representing Sierra Madre, keeping everyone involved on the legal side of decisions. "A person's background does not determine how they will vote while sitting in a City Council seat." Anyone go to the candidate forum yesterday? Anything interesting? Not me. I was at work. The only forum this year was held during working hours. Mostly boring. Everybody loves Sierra Madre, wants to be fiscally prudent, and will only allow reasonable development. Kumbaya. There were two things that were somewhat interesting. 1. Andy didn't say anything negative about the incumbents or even really give a reason why people should vote for him over them. 2. As part of his claim to support only reasonable development, he said that he was a strong supporter of private property rights. 9:17-Not really. If the UUT doesn’t get the no vote, the city will be bankrupt. That’s not new. All 3 incumbents really like the new city manager who has offered new solutions, re-financed the water bonds to a lower interest rate and the savings are earmarked to bring down the debt. The city has managed to fix 2 water problems and is moving on to the others. Andy avoided mentioning any of the things we know about him and no one asked. It was a reasonably polite crowd. Maybe more fireworks at the Woman’s Club Thursday. Private property rights is a euphemism for developer rights. Especially those who don't give a damn about existing homeowner rights, which is most of them. Very AAR. This guy must be beaten at the polls. Andy's dog whistle campaign. When he says, "I love Sierra Madre" and I believe in private property rights, he really means, "I love [all the money I will make bulldozing and McMansioning] Sierra Madre." Andy also said that he is the one that can shake out the status quo. Whatever he meant by that, it didn't sound good. He also is for "homeowners rights", that they should be able to remodel their property as they see fit. Goss agreed with him. Again, what does that mean? We have a wolf in sheep's clothing - or maybe two. The forums are always held during working hours. The Hart Park House, Seniors and Kiwanis make up the crowds of informed voters. League of Women Voters forums were always held in the evenings. That was always the one that really counted. Has the Sierra Madre UUT always been part of the city's budget? Originally it was illegally passed. Then legally passed saying 6% would never go up. What a joke. We are not a pension funding money machine. Vote YES. No, the money goes to pensions. 10:47. The UUT law said “6% will never go up”? Just making stuff up, aren’t you? The very first time the UUT went into place, it was supposed to be temporary. That was the pledge from the then city council. First you say stay at 6%, now temporary. Fine. But what pledge? Provide a citation where the entire council or the majority pledged no higher than 6% or just “temporary.” Even if there was such a “pledge” how could such a statement of aspiration bind in the face of future needs? 2:17, when the first UUT was proposed, you can imagine the amount of protest it generated. The council (30 years ago? Maybe 35?) said, "We promise this is only temporary." Some residents said, "Don't believe that hooey!" but enough people swallowed the bait to start the UUT in motion. Then it was supposed to sunset, then increase the sunset, then decrease the sunset, then what do you know, eventually it just became a permanent fixture. I’ll be voting yes on the UUT Measure D. Too bad there are so many low informed voters. Of course, there is very little transparency at City Hall, so people buy into the scare tactics, that is the loss of the Safety Services... and don’t forget the LIBRARY! Transparency? Ask for a visit with our City Manager and he will sit down with you and give you all the facts you need to make an informed decision, and that means a NO on Measure D.
Face it, Andy is going to win. Brexit. Trump. We are in a stupid voter phase. Just look at the joker who posted 10:08. I don't think he will win. This guy has no roots here. Low voter engagement election. Most people will stay home, but the people who know what he really stands for and who will profit by it will vote. Also, he's raised lots of money. Expect a flurry of last minute mailers. I'm not sure Andy is running to win. Maybe he's running now for name recognition to set himself up for a successful run in 2020. Worked for Goss. Andy Benscome is just another effort by developers to capitalize on our profitable quaintness, and in doing so, destroy it. Here's hoping the majority of the residents will see through this shill. Hey, iam with 10:08am I am voting yes on Measure D, and yes the money goes into paying those golden parachutes that city employees enjoy, stop lying to the residents that live in town and are paying for out of town retirements of others. The City handed out overly generous pensions to past employees. So let’s compound the problem by bankrupting the City. More voter stupidity. 10:38am. What do you mean by roots here? Most of the business district in town is owned by people that don't live in Sierra Madre. Most of the employee's that work in town do not live here. The swimming pool and recreation programs are operated out of the City of Pasadena as are the Senior lunch program. What's left? High property values that keep residents working seven days a week in order to support everyone else. Bringing in Arcadia style development isn't going to make your mortgage go any lower. It will help you go upside down, however. Right on. The town is basically gone anyhow. Let’s bulldoze what’s left to make way for McMansions. I mean, there’s a quick buck to be made. What could be more important? You want to see the future of Sierra Madre under Andy? Head on over to Arcadia. Some but not all cities are having a serious problem with CalPERS etc. who is to blame? Most if not all used a formula taught to them by COG, SCAG and independent cities clubs extra benefit of using the taught city management formula are also taught to use excuses and other lies when the crafted plans crumble. This might be the beginning of Bankruptcy declarations? As somebody put it the other day, the poison is already in the system. The city can only try and tax its way out of this disaster. Private property rights was what started the Homeowners and Residents Association. Whose to blame for CalPERS, the City Council. Past council members voted for the "upgrade" and later council's refused to address the problem. Even handed out "cost of living" increases! If it were not for the new City Manager this "Village" would be in dire straits or annexed to Pasadena. Arcadia would not want the debt Sierra Madre has on its books. That the Sierra Madre Homeowners and Residents Association was NOT started to protect property rights in the current sense--let me do what ever I can and want with my property--but to see that buidling codes were followed to protect homeowners from unscrupulous developement on the hillsides and over their fence lines. It was a reaction to builders and developers taking free reign in town. Code enforcement was weak to non-existant at times. The Planning Commission drew from the support of the Homeowners Association and strengthened our codes in all the residential zones, the Canyon Zone, the Hillside Zone and the Downtown. Most unfortunate thing about the UUT was the deceit and the inability to reign in the spending spree that came each year as the UUT went up by 2% points until it was supposed to sunset after downward year by year so many % points. By the date of the sunset, city spending had adjusted upward and then the hew and cry was over "hometownness" being denied us (i.e. library and local police) if we didn't go to 10% in perpetuity. Clarity was lost as these previous votes were via Proposition 218 where a mail in ballot was delivered to every property owner (this missed some as you can imagine) and if you did not mail back your ballot as a NO vote it was automatically counted as a YES. The Prop 218 was for water rate increases. Another scam. 1:37 here. 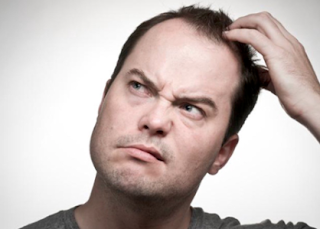 Yes, I confused the water rate hikes via Prop 218 with the vote on the UUT. Good to be corrected. The League of Women Voters have been so bias these last few forum's that I now simply tune them out. The League out of Pasadena acts as a rubber stamp for candidate's whom they support. You are so right. They never ask the questions that will make their special candidate look bad. All US citizens have to learn to distinguish between corrupt politicians, and politicians with integrity. 2:49, yes, all district 5 residents are currently under siege by Tay and his antics to get Chundler elected. Asians are being played. It’s an embarrassment to the city and an insult to the Asian population. Don’t fall for it, tell all your neighbors to not vote for Chandler. It is just about the ugliest cynicism imaginable. Rather than bringing this city together, Punk Tay plays on racial suspicion and fear. What a miserable individual he is. 12:02pm. Good thing you are not running for council, it is because of the type of thinking from people such as yourself, that Sierra Madre is in the mess that it is. Really? I thought 12:02 made perfect sense. It has taken a little more than six months for the U.S. national debt to grow by a trillion dollars, a quick clip that has little precedent over the nation’s recent history. Last night Pimp Sho Tay once again conned some misinformed minions to make fools of themselves speaking at the Arcadia City Council meeting. Who knows what they were babbling,no logic whatsoever in whatever they were saying. Some poor trash talk attempts at Councilmen Becker. Whoever that is. Best thing was seeing Pimp Tay attempting to ‘coach’ a female minion before the meeting began. Imagine him giving advice ?!?! With all the interested and smart people in his district can one of you PLEASE get involved and run for office ? Lawrence Papp went off again at Arcadia Cc meeting. He sure makes some great points. Loved how he had the balls to rip on the salary of Arcadia police chief standing 20 ft away. By the way, does Arcadia REALLY need the police chief helping the next speaker find his/her way to the podium? In fact, why is anyone needed for that job? If you can’t listen to the announcement of your name, and walk up, perhaps you should not be speaking. Kiwanis, anyone go to Meet the Candidates yesterday at the Kiwanis? Seems that Gene Goss is an open book of expressions. When ever Andy spoke Mr. Goss was all smiles and he kept nodding his head in agreement. When Ms. Arizmendi spoke he was a little less approving than with Andy but you should have seen his facial and body expression when Ms. Delmar spoke. When she spoke he just looked straight forward with a solemn look on his expressionless face. Guess it's true, Mr. Goss and his back stabbing backers support Andy. With Mr. Goss taking credit for work the ladys did you would think he would have been a little less transparent. When you look at the supporters Mr. Goss had listed on his brochure they were mostly the one's responsible for the mess the city has been in. Goss is playing both sides of the street. He stands for nothing. It sounds familiar to how Shogun Tay reacts with facial expressions when April unloads on the clown. He must have some small amount of intelligence left to at least realize she is ripping him a new one. What's with the Clint Eastwood Empty Chair statement in Kersting Court? An empty white chair is on the sidewalk in front of a banner advertising the Mayors Address to the City. As of now Jose is beating Delmar. Jose has mailed to every voter and Delmar's people are running around dropping literature to people which is too little too late. Just saw a Jose Facebook ad. Delmar didn't even say she was an incumbent on the ballot. Delmar is in serious trouble unless she starts mailing. So the Sierra Madre voters are believing this fraud who represents realtors and developers, and ignoring the excellent work for the last 4 years by Delmar? If that happens, the town will get what it deserves. "Andy" (his real name is Jose) is kinda like a Carpetbagger. He's firmly entrenched in the Arcadia Realtor Association and is running for Sierra Madre CC kinda for the fun of it and to help his real estate business. He is not a long time Sierra Madre resident and would have a better chance running in Monrovia or Florida where he moved from. Heard someone say, and perhaps it is nothing but rumor that Joyce Platt's campaign has hired someone to besmirch Roger Chandler and Jolly Wu her District 5 competitors for city council. How plausible can this be? Mrs. Platt is a warm, cuddly-hugging caring senior citizen and retired "school marm". Hiring someone to denigrate a competitor's run for office spewing negative statements and information to ingratiate herself is very difficult to imagine...or is it? 8:13 Delmar is interested in letting people know she is ultimately qualified to be re-elected by her statement of profession. Goss didn't list himself as an incumbent either.